Learn how to access millions of coastal aerial photos right from your desktop using the ShoreZone Alaska Flex Site. A program originally brought to Alaska to support oil spill planning and response efforts in Cook Inlet has since expanded to most of the state with uses from coastal monitoring to art and education. The coastal mapping endeavor ShoreZone’s Alaska debut was as a Cook Inlet Regional Citizens Advisory Council pilot project in 2001. Now, about 80 percent of Alaska’s coastline is mapped including Southeast Alaska and the North Slope. ShoreZone provides public access to a coastal map that includes several elements: high-resolution photos, videos, and data on the biology and geomorphology of the coast. “Having the biology and the geology together is a robust data set,” said ShoreZone’s Darren Stewart, who works for The Nature Conservancy as a coordinator among the various partners. In addition to oil and gas uses, the database is valuable for Coast Guard search and rescue operations, researchers doing reconnaissance and selecting sites, marine debris cleanup efforts, and recreation planning such as planning kayak trips and looking for safe landing spots for boats, Stewart said. “Being able to see an area before you get there saves a lot of time and money and resources,” Stewart said. This summer, the National Marine Fisheries Service is funding the next step in mapping Alaska’s coast - about 2,500 miles along the Yukon-Kuskokwim Delta shoreline from Cape Newenham to Emmonak, including Nunivak Island. That work will be done in two surveys in July and August, and cost about $300,000. NMFS is the primary funder this summer, but the Yukon Delta National Wildlife Refuge will provide various services like fuel drops, lodging and other logistics support, Stewart said. A private contractor, Coastal and Ocean Resources Inc., or CORI, collects the data that feeds into the maps. A biologist and a geomorphologist will ride in a helicopter along the coast, taking video and shooting still images, and narrating along the way. Generally, the team will follow the same standardized protocol that has been used throughout the state - including doing the work when there are the lowest tides and the most light. In some places, additional information is collected based on interest - for instance, a baseline hydrocarbon study was done on the Nort Slope. Later on, mappers will listen to the narration and use the imagery to create maps in units. That can take several months, and depends on funding, Stewart said. Eventually, the database that’s built allows for queries about a variety of things - where logs are likely accumulate, whether a stretch of coast has pebble or boulders or a sandy beach, and the habitat there, said CORI’s John Harper, who has been involved with the project since it started in British Columbia. CORI has done all but one of the surveys in Alaska, according to Stewart, and funding has come from a variety of partners - about 30 to 40 organizations have been involved at one time or another. “It’s very cool that we’ve had this array of funding,” Harper said. ShoreZone has its roots in oil spill planning - the program started in British Columbia for that purpose, and first came to Alaska for the same. In 2001, the Cook Inlet advisory council, or CIRCAC, decided to see if ShoreZone could fill that need and funded the first pilot project. “We wanted a better inventory of all the coastlines in Cook Inlet,” she said. The early goal was to provide habitat information and imagery that could be used in emergency situations. The more information that is available about the coast, the easier it is to plan for a spill and cleanup, and minimize the impacts, because different habitats and landscape types respond differently to various treatments, she said. For instance - oil will linger longer on a slat marsh than an exposed stretch of rocks. ShoreZone provided the information that CIRCAC wanted, so after the pilot, the group started approaching other potential partners around the state to get involved. Within three years, all of Cook Inlet, the outer Kenai Peninsula coast, the Katmai region and northern portion of Kodiak were mapped. “I think the imagery is what really sparked people’s interest in making that happen,” Saupe said. Eventually, the project expanded to Southeast Alaska, and then Bristol Bay and most recently the North Slope in 2012 and St. Lawrence Island in 2013, Stewart said. The uses within the oil and gas realm are varied, Saupe said. “This imagery has so much value, I think, in oil spill planning and response,” Saupe said. Saupe said the program helps an oil spill response team on several levels - operations, planning and logistics. During the 2012 Kulluk incident when the Shell drill rig separated from its tow and went aground in a storm near Kodiak, Harper said the response team relied on ShoreZone to figure out where to land, where to store booms and how to prepare for grounding and minimizing damages. Today, the ShoreZone website is accessible to anyone with a computer and fast enough internet connection. Log on, and you can fly all the segments of Alaska’s coast that are mapped. Early on, the ShoreZone partners had to figure out how to make the data available, as the database deliverable was simply a disc of information, imagery and maps, Saupe said. In 2004, the National Marine Fisheries Service agreed to host the data and make sure it was seamless throughout the various regions of the data, and in 2005 the agency released the first integrated website, making all the data collected so far available to the public. The website is always being improved, Saupe said. “It’s just a constant effort, constant effort by NOAA to keep upgrading, take advantage of new tools,” she said. More recently, the video displayed on the website went from one second capture to full streaming video for certain portions of the database. Saupe said the partnership is always looking for ways to improve access and use of ShoreZone in oil spill planning and response, and in other capacities. One of the efforts has been to create offline tools, so that responders in areas with limited internet access can still use the ShoreZone information. An early iteration of that effort is available by borrowing a hard drive and pulling all the data from it, but that’s a cumbersome process. Another version is in the works, which would allow users to pull the data right from the internet onto a local drive. For now, however, Saupe said the website remains the best way to access the data. CIRCAC has also worked with the Alaska Oceans Observing System, or AOOS, on a program that integrates ShoreZone data with other information responders might want, Saupe said. 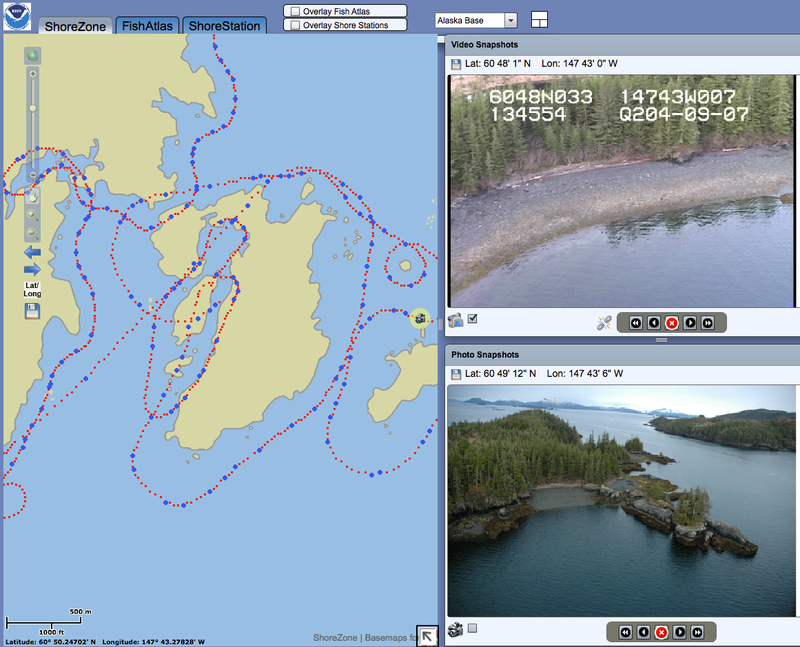 The Cook Inlet Response Tool includes more than 100 data layers, such as ShoreZone habitat information and video, realtime weather sensors and webcams, oil persistence, and marine mammal information. AOOS also has ShoreZone data merged with additional databases for other regions of the state, including the Gulf of Alaska, Prince William Sound and the Arctic. “The goal was to take this ShoreZone imagery the next step,” Saupe said. CIRT also includes Geographic Response Strategies, which are pre-planned, site-specific protection measures for anadramous streams, archeological sites and other places considered fragile or in need of protection. Those were commissioned by Alaska’s Department of Environmental Conservation, and are available throughout the state, although they - like ShoreZone - began in Cook Inlet. Other patches remain to be mapped, including Norton Sound and parts of the Aleutian Islands, in part because it’s difficult to find funding for those areas. Other gaps in the data are the Southwest Alaska Peninsula, including King Cove and Sand Point, which are imaged but not mapped, Glacier Bay, the Pribilof Islands and Unimak Pass. The western Aleutians will be particularly difficult, and may have to be done by boat, Stewart said. “Even though its logistically challenging space, getting the Aleutians done is really important,” Stewart said. Harper said that Unimak Pass is a priority because of the shipping traffic in the region. “Even just regular cargo ships, they carry huge amounts of oil onboard,” Harper said. For now, there’s no set plan for updating the information as the coastline changes, although the mapping protocol relies on small homogenous units, so updates could be done piece-by-piece if necessary. Saupe said that the Cook Inlet was already reflown in 2009, as technology improved and the original imagery became outdated. The imagery statewide is also useful for gauging change, she said. “That imagery has become a very important data source in and of itself,” she said. The survey process itself also leads to other interesting discoveries, Saupe said. For instance, during the Gulf of Alaska mapping, researchers discovered that macrocystis kelp beds previously thought not to extend past Icy Strait are actually found in the western Gulf of Alaska. After a small bed in Kenai and a larger bed in Kodiak were noted, CIRCAC funded dive studies to learn more about the habitat, Saupe said, and researchers have looked through historical records to try to learn more about its range, and if this is a change. CIRCAC has also used the habitat information from ShoreZone to develop further studies of salt marshes in Cook Inlet, she said. ShoreZone has also been used to develop two art exhibits, which pair large prints of the photos taken during the survey with scientific information about each area. The exhibits looked at the Gulf of Alaska and the Arctic, and have been installed in various places throughout the state, including the State Museum in Juneau. Communities also use ShoreZone for coastal planning, Stewart said. “Just to get a good bird’s eye view of what’s there on the coast,” he said. ShoreZone is also a tool for education, Saupe said, both in schools and communities. Saupe demonstrated the website in Kodiak. She had a young girl spot the place where she had taken a long beach walk, and a woman point out important archaeological sites around the island. A U.S. Coast Guard member responsible for pulling information when preparing for rescues said it would help with that work in the future. “Right there, you just had all these different levels of interest,” Saupe said. The website is also being used in some schools, both to learn about the coast and as the basis for other projects. One projects has students using the imagery to collect history and information about the villages and surrounding areas from local elders, Saupe said.